Having completed the mechanical calibration yesterday, it's time to move onto extruder/print calibration. I then changed the values in the configuration.h and reloaded the firmware. Rt-Click the slic3r.exe file and drag it onto the Quick Launch bar. When you let go, choose Create shortcut here from the context menu. Extrude 30mm, 5mm at a time with small pauses. This is to ensure you aren't extruding too quickly. If the results mean you need to change your config, then upload these changes using Arduino. You should repeat the test to make sure it is now correct. 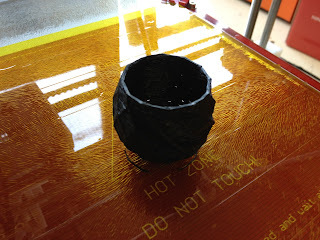 Don't forget to remove the tape from the filament. Layer height - changed to 0.3mm based on his recommendation for a 0.5mm nozzle. Fill density - changed to 25% as I'll be testing things out and based on RichRap's article, this is a good general purpose value. This version of Slic3r now has a Generate support material setting. 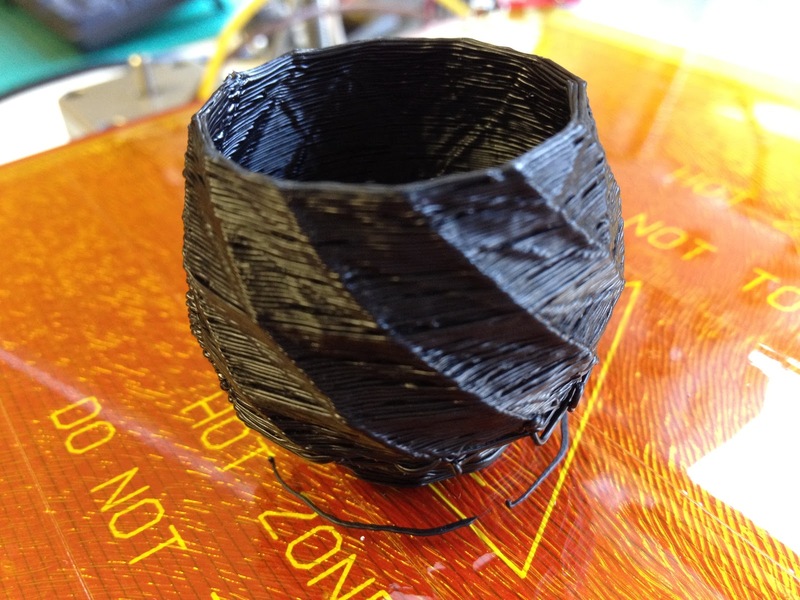 This looks like a useful feature to experiment with, even if using the same extruder. I'll have a go sometime, but for now I left it switched off. Speed - I changed this to 16mm/s as this is what RichRap used with Sprinter firmware. I may need to revisit this in the future. I decided to copy RichRap's Start/End GCODE settings as they make sense to me (this is copied directly from his article). G1 Y170 F4000 ; move the print to the front. M104 S0 ; make sure the extuder is turned off. M140 S0 ; make sure the bed is turned off. M84 ; shut down motors. I downloaded WickedAndy's polycup as per RichRap's article and sliced it. The resulting code said it would take around an hour to print, so I thought I would start with something a bit smaller. I simply setting Slic3r to scale the object to 50% and tried again. Result! ETA 12 minutes. So I thought I would switch on the heated bed and hot end to get them warmed up first, but noted that now my heated bed isn't heating!!! So, 2 steps forward, 1 step back. First thing, test the output voltage. Check! Next, check the PCB wiring. Aah! Seems one of the soldered joints gave in. Wonder if my solder is up to the job? Anyway, re-soldered and let's try again. I didn't wait for the bed to heat up properly.